It is now exactly four weeks since the start of GBRow 2013. Today is also the start of the Tour de France. There’s no doubt about it, GBRow is the Tour de France of rowing. With one record already smashed in this race, our focus is now on Savoir Faire, the only boat left still racing, four weeks after the race fleet of six boats left Tower Bridge on Satruday June 1. 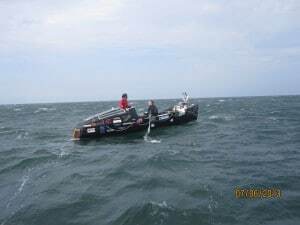 Josh Tarr and Jason McKinlay, from Salcombe, Devon, could set a new world record for a pair rowing non-stop around the British mainland. The question is how many more days will it take them to reach London? This morning they are between Montrose and Arbroath, north of Dundee, still going at 2knots after battling headwinds all night.